The Florida Brewing Company and the Ybor City Ice Works. Verso "From the Plant System tracks on the year 1898. 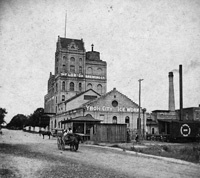 The Ybor City Ice Works was the second plant installed for the production of artificial ice and was utilized for the production of beer by the Florida Brewing Company."